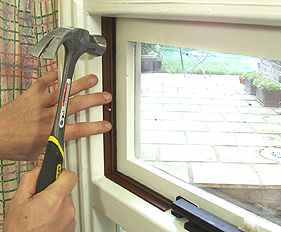 For casement windows there are many differing products available to help reduce draughts. For a very quick, inexpensive solution you can choose between various similar products which stick to the outer edge of the frame so that when the window closes it is forced against the seal. This can be a foam strip, a rubber P-shaped strip, a rubber E-shaped strip, or more plastic V-strip. All essentially do the same job. Readily available at most DIY stores. These are usually self adhesive so you just cut the size you need and stick them on. They will come in varying thicknesses so you need to get something that is right for your gap. Too thin and you won't solve the draught problem. Too thick and your window may not close properly. They will tend to compress and wear over time but are very inexpensive. Make sure you clean any dirt from the frame to ensure they stick well. An alternative method uses a bristle strip which has very short soft bristles. (don't confuse this with the much longer brush strip which is for the bottom of your front door). Bristle strip screws or nails to the frame on the inside. The disadvantage of these is that you will see them although they do come in several colours (usually white or brown). They are however very effective at keeping out draughts especially because when you fit them its easy to position them precisely. 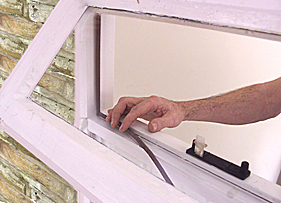 With the window closed simply offer up a length of strip that you've cut to size. Slide in right up to where the window closes against the frame. The strip usually comes with pre-drilled holes and a pack of small pins or screws.You simply nail/screw them in place. 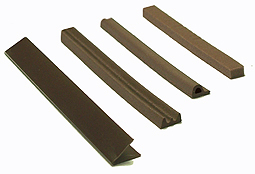 They provide a very effective and reliable draught seal and are very hard wearing.They are slightly more expensive than compression type foam/rubber strip. Bristle strip. With the window shut nail it to the frame all around the window. NB shown here in brown purely to illustrate. You can use white strip on a white window.